Details relating to the Luxembourg Commemorative of 2011. This coin commemorates the 50th anniversary of the appointment of Jeans as governor of the Grand Duchy by his mother Charlotte, the Grand Duchess. 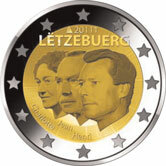 The motif for the coin simply shows the effigies of the current reigning Grand Duke and two previous heads of state. Left to right we have Charlotte, Jean and Henri. At the top of the inner circle is the year of issue flanked on the left by the mark of the mint master and on the right by the mint mark. Thereunder is the name of the issuing country “LËTZEBUERG”. An interesting feature of the coin is an inner ring which consists of the name of the Grand Duchy in the three official languages – French, German and Luxembourgish - “Grand-Duché de Luxcembourg”,“Großherzogtum Luxemburg” and “Groussherzogtum Lëtzebuerg“. These are written in microscript in concentric rows. The ring consists of nine rows. From eight to six o’clock, within this ring are the names Charlotte, Jean and Henri. From Luxembourg Commemorative 2011 to euro coin collector.